Disaster recovery continues, but before updates on that I want to remind you we have not stopped working on a variety of other issues as constituents call and need assistance. If you need our assistance, please do not hesitate to let us know! FEMA yesterday announced the opening of a Disaster Recovery Center (DRC) in District 150. The newly opened DRC, one of two added this week to the three already open in Harris County, is located in the Klein Multipurpose Center at 7500 Farm to Market 2920, Klein, TX 77379, which is roughly halfway between Spring and Tomball on the north side of FM 2920. More information on FEMA sites is available by clicking here . Note that this is accessed from FM 2920, not from I-99. A Google Map link of the location is clickable here . Note again that this is accessed from FM 2920, not from I-99. My staff and I are committed to doing everything we can to speed recovery, cut red tape, and otherwise help in any way we can. As mentioned above, call or email on other needs as well, as the entire Gulf Coast area slowly gets back to normalcy. Our local district office number is 281-257-4222. You may email me directly at Valoree.Swanson@House.Texas.Gov . As is my practice recently, below in the yellow box are links to information you may find helpful in your particular case. It is humbling to serve you in District 150. SBA loans are NOT just for Small Businesses! There is a downloadable PDF version of the loan guide on my website at http://www.valoreeswanson.com/harvey-recovery-information/ as well. The state of Texas has been conducting aerial spraying for mosquito control. This is being accomplished using fixed-wing assets spraying in much the same way crop-dusting is done. Larger-than-cropduster planes are being used, including C-130s. Please note that due to federal regulations in place since 1973, a Harris County permit to repair/rebuild is needed if you flooded. Most permits are anticipated to be mailed quickly after talking to Harris County over the phone, based on your address (281-353-8424 or the Debris Hotline at 713-274-3880). If you flooded and are within the 1% risk area, (commonly called the 100-year floodplain), an on-site inspection may be needed. Please share with your impacted neighbors and have them sign up for my email list for more complete information. Harris County has issued several informative bulletins on this and on debris removal. These can be viewed by clicking the links below. Relating to the permitting, please note the fourth one in particular. VOLUNTARY HOME BUYOUT INFORMATION from Harris County Precinct Four. Click here. For those of you who want to move your storm debris directly (and not wait for the county), the county has just announced a self-serve drop-off point. The Public Storm Debris Drop-Off Site is located at 13928 Humble Road in Tomball off Highway 249 and is open daily from 9 a.m. to 5 p.m. throughout the flood recovery effort. Residents of unincorporated Harris County must provide proof of residency and must personally accompany their load. For more information, please click here . Several Municipal Utility Districts (MUDs), Homeowner Associations (HOAs), and even groups of neighbors are investigating hiring private contractors to remove debris from their neighborhoods faster. A common concern is where to dump the storm debris. Harris County Precinct 4 graciously provided the following list of area dump sites. The Harris County debris removal site (address below) is free for residents; no contractors. It is currently open 7 days a week from 9 am to 5 pm. At the same address is the "Self Serve" drop-off site, which may have reduced hours (see yellow box link below). 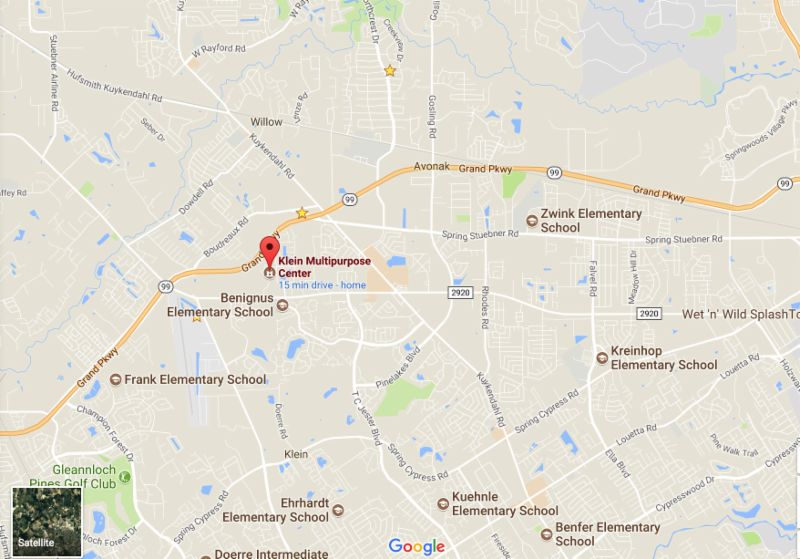 The Harris County Debris Drop-Off site above is free to residents , but you should have proof of residence. Contractors unaccompanied by their client residents cannot use this facility. Below is a list of private for-profit companies that residents or contractors can use for a fee . If you use one or more of these and would like to provide feedback, that would be helpful to all. The map at the right can be accessed at http://www.harriscountyfemt.org. It allows checking particular addresses for whether or not they are in 1% or 0.2% flood chance regions (commonly referred to as 100 and 500 year flood plains). We will repeat this box as needed for the near-term on newsletters. There are numerous resources, mostly provided by volunteers at present, while longer term assistance is being set up through various agencies. The State Republican Executive Committee (SREC) has set up an amazing network of volunteers who are collecting and moving relief supplies to areas where they are needed. Let me or or my staff know if you want to help in this effort. 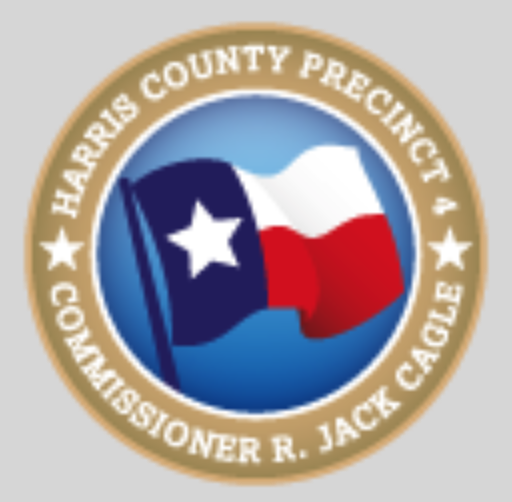 Harris County issued several informative bulletins on permitting and debris removal, that you can view by clicking the links below. Relating to the permitting, please note the fourth one in particular. 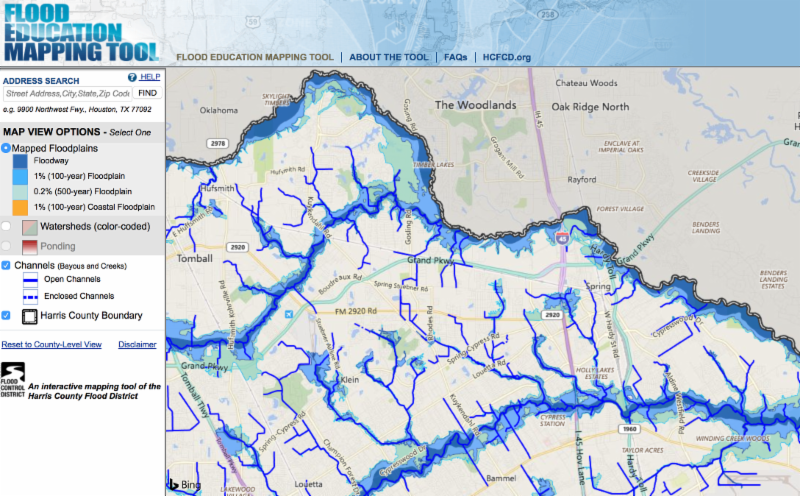 Harris County Flood Control online flood plain mapping: http://www.harriscountyfemt.org. Additionally, we've become aware of various sites to link people needing help with willing volunteers. One of these is https://www.texasrescuemap.com/muckmap#volunteerDialog. NEW: Harris County Precinct 4 Self Serve drop-off point. Link here. Map here . A vast array of information and contacts has been compiled through many people over the past week. Click here to see our latest list, which itself contains many hot links to other groups. Additionally a FEMA Fact Sheet is located here . While part of this is focused on government procedures, pages 3-8 include information INDIVIDUALS and SMALL BUSINESSES may find helpful. There is, for example, an "Individuals and Households Program" that can provide up to $33,300 in damage recovery funds for items not insured. An interactive map (Harris County) with Flood Plains can be accessed at http://www.harriscountyfemt.org . All debris must be within 10 feet of the curb for the machines to reach it. Vehicles cannot be obstructing debris or access to streets. Mechanized equipment will pick up everything in piles, including mailboxes, fire hydrants, etc. DO NOT PUT DEBRIS AROUND PERMANENT ITEMS. A second round of debris pickup will occur three or more weeks later. 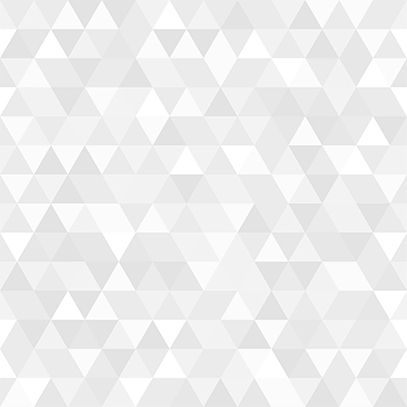 Sorting: If piles are ALREADY near curb, do NOT re-sort. If still piling debris, please sort by electronics, appliances, demolition debris, vegetation, and hazardous waste. Paid for by Valoree Swanson Campaign - Norma Jeter, Treasurer. Not paid for with taxpayer funds. please click here to sign up for your own copy!